Over Pesach I made Pam Reiss’s delicious meatloaf (I would post the recipe here, but I already put the book away with the Pesach stuff….). It was a huge hit – so much so that I made it twice, and the second time, I made two – one with Pam’s delicious tomato sauce topping, and one without for the purists. So the KoD got to reminiscing about his mother’s meatloaf that he insists she used to make with mashed potatoes in the middle of it. I told him it’s impossible as the meatloaf would squash the potatoes as it cooks. We even asked his mom, who maintains that she put the mashed taters on top and hard boiled eggs in the middle of the meatloaf. KoD is sure we are all wrong!! In your experience, is it possible to make a meatloaf with mashed potatoes in the middle? I wish I could make meatloaf but my kids can’t stand it. I have heard of meat loaf recipes with mashed potatoes in the middle. The KoD is always right !!!! darn, I need him to be wrong about something…..pssshhh….. Thanks LLL for the vote of confidence. did you not wish to add, dear KoD, how absolutely scrumptious my meatloaf was?? QoH, that is a given!!! yes, I’ve done it before, and it “works”, but the best way is to frost it on the sides and the top with the mashed potatoes. Then it captures all the meaty juices that try to escape while it’s cooking. I’m not sure about potatoes, but my mother made meatloaf with cooked spaghetti in it once. And I do mean once. The cat wouldn’t even eat it. It’s the only meal my mother ever made that wound up in the garbage. I’ve never heard of it with the potatoes in the middle, but my mom used to make it with the mashed potatoes on top and a layer of sauteed mushrooms between the meat and potatoes. But I don’t see why not! I have no experience with the potatoes in the middle but I am a meatloaf lover and I will have to try that. It sounds delicious. Thanks KoD for the inspiration. Is there any way you could recall the name of the COOKBOOK if you can’t get the cookbook out of the Pesach stuff? And, if Pam doesn’t mind, couldn’t she send you the link and you could post it? My wife is always asking if Hadassah has sent any more recipes recently. my wife’s brilliant idea for this is to make the potatoes in advance, freeze them in the shape of the center, then build the meatloaf around it and cook. 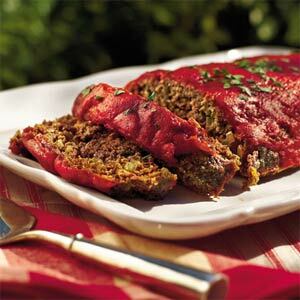 Not being a huge fan of meatloaf, it is unlikely she will actually get to try this, but it’s worth a shot. Either way you would end up with a yummy mess.